Ian Trevett talks to Julie Kapsalis, the busy Vice Principal at Chichester College, who also manages to find time to be a board member of the Coast to Capital LEP, the Chair of Chichester Chamber of Commerce and look after a young family. 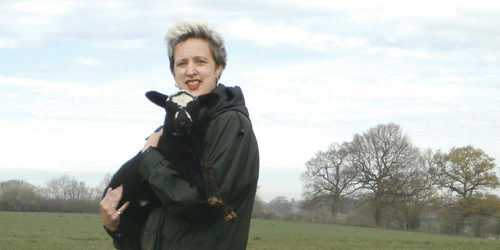 After a career in PR, promoting some of the world’s most high-powered brands, Julie Kapsalis now finds herself quite at home in a muddy field showing off sheep. “I’m passionate about understanding the rural economy and engaging our young people in its development. At the recent Cranleigh rural show we had three of our team from Brinsbury showing sheep. I never thought I could get so passionate about showing sheep. Starting a business interview with sheep showing may be a tad unusual, but it is a classic example of how Julie loves to throw herself fully into any project. If her students happen to be showing sheep, Julie wants to know exactly what it involves. Julie’s career began in PR and marketing, evolved through to business development roles and now sits comfortably managing the commercial side of a large educational establishment. She started her career in PR managing international brands such as Becks Bier and Fosters, as well as international darts tournaments. Julie enjoyed 10 years at the South East England Development Agency (SEEDA), where her passion for supporting businesses grew. At SEEDA Julie progressed to Director of Business Programmes. She was invited to be an advisor to the UK Government’s task force on women’s enterprise, which was set up by Gordon Brown, and was also involved in the bid for London to host the 2012 Olympics. As the Olympics started, Julie had her second son and she took a six-month break from her career. She returned with a short stint at Guildford College before taking on her current role at Chichester College in August 2014. In the same year, Chichester College’s Ofsted Report was judged as outstanding. The role at Chichester includes looking after the college’s commercial businesses, as well as an examination board, an international language school, a chain of three childcare nurseries, plus the apprenticeship schemes. Chichester College covers the whole spectrum of education, both academic and vocational. “We are really proud to have a 99% pass rate at A-Levels. Our student demographic is really varied. We have 14-year-olds, through to people in their 70s and 80s on adult courses, plus a range of ages in people studying to change their careers. We offer traditional academic A-Level subjects and a wide variety of vocational courses. We’ve got about 3,000 apprentices, so that’s a really important area for us. Julie’s PR background has been invaluable in her approach to the commercial success of Chichester College’s international language school. “PR is particularly important in certain cultures. Japan is our biggest market, China is also important. It is all about building relationships; the whole culture of meeting with the right people and exchanging gifts. Some of the lovely things you can see in my office form the eclectic collection of gifts from foreign delegations. It represents that sense of trust. As well as the day job, Julie is a board member at the Coast to Capital Local Enterprise Partnership (LEP), where she chairs the business grants panel, and she is also Chairman at the Chichester Chamber of Commerce. She has an in-depth understanding of what local businesses and the students need. But one thing she doesn’t need is any more furniture. As she shows me around the exhibition of furniture designed and crafted by students, she points out the items she intends to buy. “My husband will kill me! Every year I bring home new furniture and we don’t have the space. But the quality and craftsmanship is just so good!” As always, the students come first.